It's official. The contract is signed and I'm allowed to talk about it: I'm writing a book. 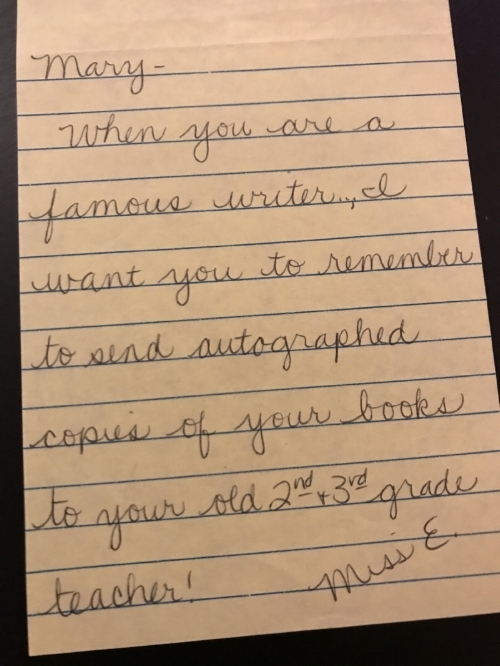 When you are a famous writer, I want you to remember to send autographed copies of your books to your old 2nd & 3rd grade teacher! - Miss E.
It's appropriate that I'm writing about this now, given that Teacher Appreciation Week just ended. I'm sure I would have still been driven to write, regardless of that particular teacher's praise, but I'm not sure I would have believed in myself the same way. I've been thinking about Ms. Edwards's note a lot these past few months as talk of this book on building technical communities has solidified, and the idea of writing a book has become more and more real. We've planned, written a proposal, had an amazing editor polish said proposal for us, and now I've officially signed the contract. In other words, I'm now staring down the barrel of an ambitious schedule of writing, editing, and submitting 10 chapters over the next 6 months. As I said above, this thought simultaneously makes me excited and nervous. Lucky for me, I've got 3 others by my side who volunteered me for the position in the first place (thanks, Nathen! 😉 ) and who are all amazing community builders in their own right. We also have an amazing editor who is equally as, if not even more, excited about this process. I bought a "Self Journal" on a whim a month or so ago, and finally cracked it open last Tuesday to fill out the goals, set some realistic expectations for myself, and plan out the next 13 weeks (by the end of which we'll have submitted 5/10 chapters... 😳 ). I've got one day/week set aside for writing (thank you, thank you, thank you, SparkPost) and a plan to schedule the heck out of those days to make the most of that time. and then commented that he does actually understand that concept, and reminded me that I should give myself credit where credit is due (aka don't be so hard on myself 😏 ). I took the first steps last Tuesday. I got off at the wrong train stop because I was engrossed in a book (typical me) but found a great coffee shop as a result and spent the late morning and afternoon planning, organizing, and finally, starting to write. In short, I wrote the first 1,000 words that day, and another 1,000+ yesterday. There will be many more words (and days) to come, and who knows if those 1,000 words will even be in the final manuscript. But they're down on paper. They're a living thing now. And this is happening. As my lovely editor pointed out the other day when I used the hashtag #AlmostAnAuthor... I am an author. It's official. Almost. Kind of.